In this episode, Mike and Glen discuss discuss the removal of standardized testing from teacher evaluations, and about whether we should be changing the start time of school, and how that may benefit students. We’ll also chat about how a video game may be the key to restoring the Notre Dame cathedral after the incredible fire last week. A new report from EdBuild is out talking about school district segregation. We also have two amazing guests this week: educator, speaker, and author George Couros joins us, and we welcome neuroscientist Dr. Jared Cooney Horvath on the pod to talk about his new book “Stop Talking, Start Influencing” References: Guest : George Couros Twitter :&nbsp; &nbsp;and you will receive the first month free on a monthly premium subscription. Premium features include Boss Battles for formative review and much much more! Badge Summit: Do you have plans to attend the ISTE conference this summer? Come one day early and participate in the best hidden gem conference in the United States. Badge Summit 2019 will take place on the Temple University Campus in Philadelphia on June 22. Episodes of OnEducation Now! 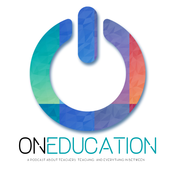 are special editions of our weekly podcast: OnEducation. OnEducation Now! gives you easy to listen to information on what's going on right now in Education. We'll tell you everything you need to know about an important issue happening NOW. It's April 19th 2019, and Mike Washburn speaks to Ontario's Opposition Critic for Education Marit Stiles. Subscribe to OnEducation for Mike and Glen's weekly take on teaching, teachers, and everything in between. Game of Game of Thrones | Dr. Amy Cooper & Claudio Zavala Jr. In this episode, Mike and Glen discuss the purchase of Flocabulary by Nearpod and&nbsp;the amazing first images of a black hole taken this week. We have two amazing guests this week Claudio Zavala Jr. and Amy Cooper References: Guest : Claudio Zavala Jr. Twitter :&nbsp; &nbsp;and you will receive the first month free on a monthly premium subscription. Premium features include Boss Battles for formative review and much much more! In this episode, Mike and Glen discuss what is going with education in Ontario, the student walkouts, and teacher protests that have happened over the last week.&nbsp;They will debate if there is a better way for companies to spend their marketing budget than giving away swag. Our guest this week is Dr. Chris Haskell from Boise State University. References: Guest: &nbsp;Chris Haskell Twitter :&nbsp; and you will receive the first month free on a monthly premium subscription. Premium features include Boss Battles for formative review and much much more! In this episode, Mike and Glen discuss the Apple Special Event held last week and the looming teacher walkouts in Oregon, North Carolina & Kentucky. We’ll talk about why instructional coaches work well in some districts while failing miserably in others. Our guest this week is friend of the podcast, expert in many educational areas, and all around amazing guy Noah Geisel. References: Guest: &nbsp;Noah Geisel Twitter :&nbsp; &nbsp;Upgrade a Classcraft account to Premium! This purchase includes a twelve-month, single-use&nbsp;Premium license code which can be can be activated from within Classcraft. Perfect if you want to purchase multiple licenses or give them away as a gift.